Revive PT are just as invested in your goals as you are. We judge ourselves on how well we can help our clients reach their ultimate goal, and beyond. Over the years we have had quite a few members achieve some incredible results using our blend of nutritional guidance, training, and mindset coaching. This is one of our Super Fit Mums Britt. 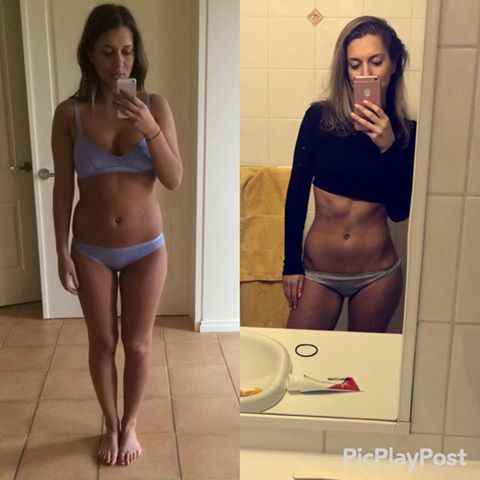 She started with us in June 2018, and is still with us today continuing to work on her goals and make daily progress towards her healthiest, happiest, strongest and fittest self! Down 9kgs, oh and abs, in 9 months! Aaron posted some serious numbers after finishing his 12 Week New Years Challenge. Now: 12.8kg ⬇️ 10.1kg of FAT! After having my second bub in March (2 under 2! ), I struggled with motivation to exercise again. I shopped around looking at the traditional leisure centre putting the kids in childcare and PT studios. When speaking with Liam over the phone, he showed empathy compared to some places I called and that is why I decided to test drive Revive. Liam and the entire team at Revive PT have been amazing since I’ve started. I’ve only been going 4 months and I can already feel and see differences just from the exercise! Thank you for helping me find a place I can go, to exercise with the kids (Fit Mum classes are the best) but still feel like it’s ‘me’ time focusing on my health! Worth every cent! "I lost 2.5 (6kg) of these bad boys in the last 10 weeks. Thanks to Liam Crivelli & all the cool kids at Revive PT Eltham." "I couldn't be more happier with my results so far after following the meal plan I asked Liam to write up for me 8 weeks ago. It's not that I ever thought something was wrong with my body, I just simply wasn't happy or confident with it. My diet has never been horrible, I just wasn't eating the right things or eating enough. With work and sickness getting in the way of regular sessions at Revive, following this personalised meal plan has helped me stay on track, I can't wait to see more and more results to come! Couldn't thank Liam or the Revive team enough for their support and encouragement 👌💪"
I am forever thankful I found Revive PT! After four pregnancies in five years, and significant stomach muscle separation that requires a more mindful approach to exercise, I was so happy to finally find a group PT environment that not only could cater to my needs exercise wise, but the workouts fit into my day and I’m able to bring any of my three children with me. Revive have created a positive, challenging and encouraging environment, where there is a focus on technique, form and method, as well as continual improvement. All of the trainers are highly professional, friendly and supportive and wonderful with my baby girl and two older boys. Not to mention the other women I’ve met and train with are all so lovely. I couldn’t recommend Revive enough and I am excited that I’ve finally found a place where I can start this next phase of my life and get my strength and tone back!